When most people picture a water heater, the first thing that comes to mind is the traditional variety that comes with a tank. The tank holds hot water, making it easy to run a hot shower or use hot water to wash the dishes when needed. However, there are more eco-friendly models known as tankless water heaters, or demand water heaters that do not have a tank. Instead, they heat water up as it is needed. These models are more environmentally friendly since they do not waste energy having to keep a giant tank full of water constantly hot. You will also not run out of hot water with a tankless system, since they heat the water as it is needed, and keep it flowing consistently. Switching from a traditional tank-style water heater to a tankless model is a job for a plumbing professional. There are two different models to choose from: electric and gas. The electric type requires that your house have very specific electrical system requirements, while the gas variety uses the existing type of gas that flows to your house. It can work with either natural gas or propane. 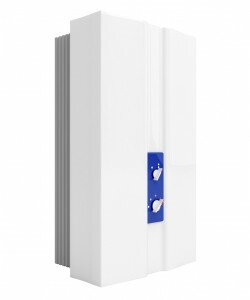 There are also different sizes of tankless water heaters, which all have different flow rates. The size that you choose depends largely on what you need it for – smaller models work best with a single bathroom, while sending hot water to entire house requires a larger size. Maintaining a tankless water heater is fairly easy, since you do not have to worry about the giant tank of water in your basement rusting and springing a leak. Tankless systems should be checked yearly by a professional plumber, just to make sure that they are running efficiently. If properly cared for, a tankless system can last for over twenty years.